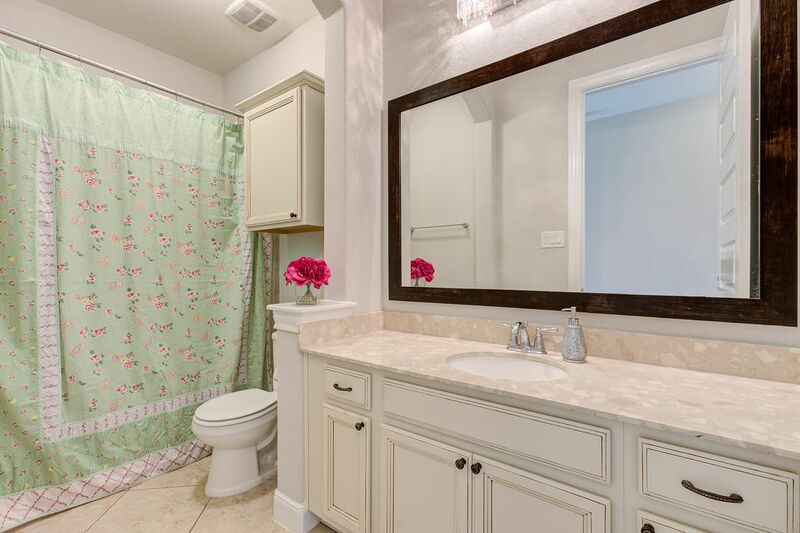 17102 Upton Hill Drive, Cypress, TX 77433 | Martha Turner Sotheby's International Realty, Inc. 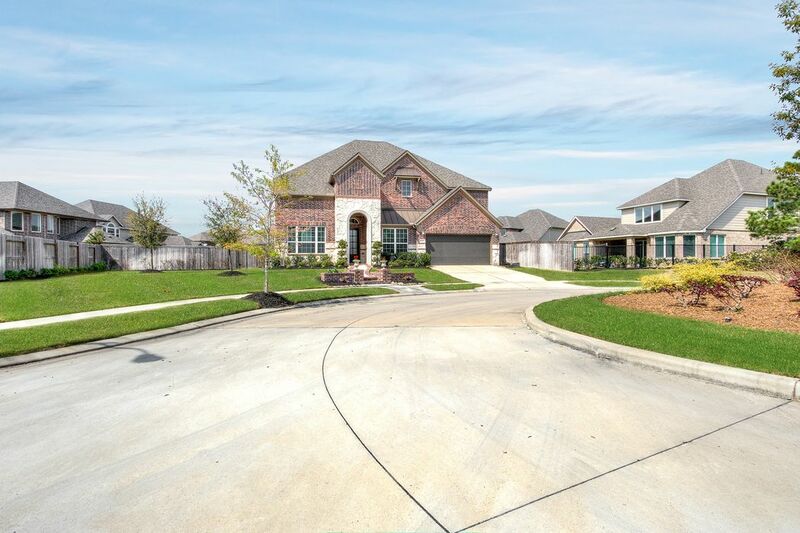 Welcome to 17102 Upton Hill Dr. Meritage Waterleaf plan situated on an over sized, 13,470 sq ft cul-de-sac lot. 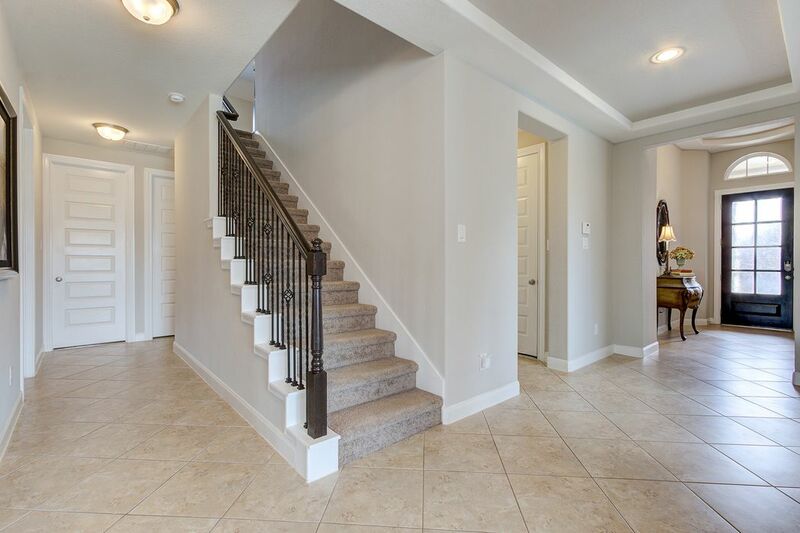 This great 4 bedroom Bridgeland home is in an ideal location with an ideal floor plan and yard. 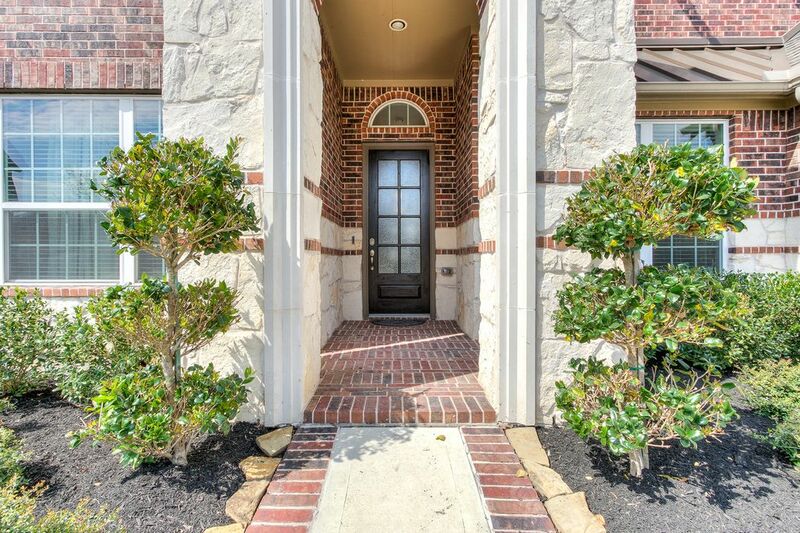 Brick paved entry way accenting your flanking established landscaping and stone accents. 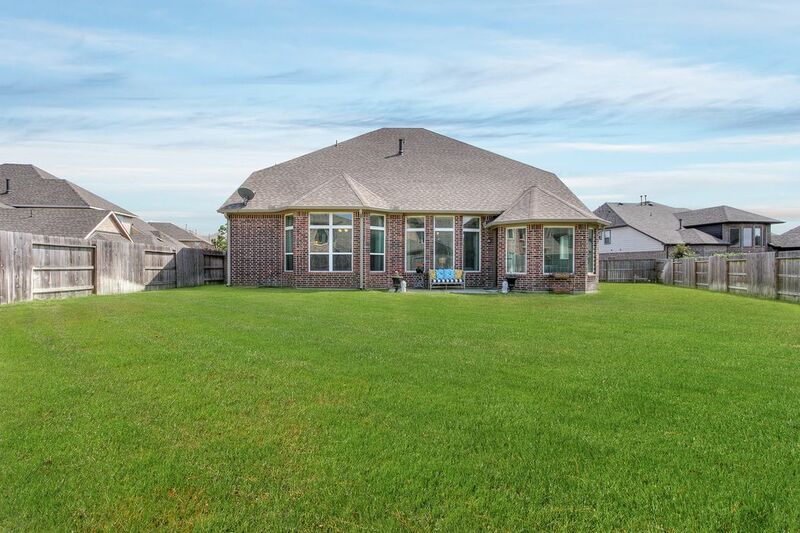 A quick glance at your large back yard with room for pool, kitchen, play space and more. Bright and open flowing gathering area. 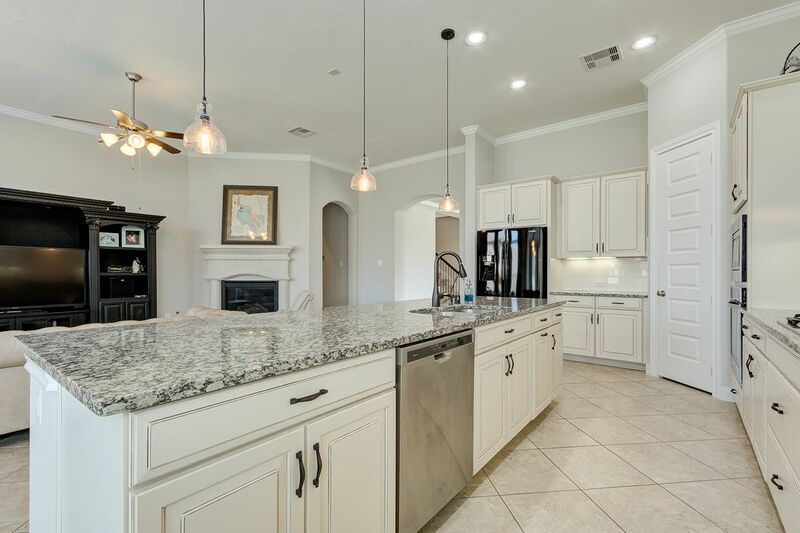 This kitchen with large center island and cabinets to spare gives space everything and everyone. Large walls of windows allowing light to pour in, accenting the light and neutral color palette in the home. 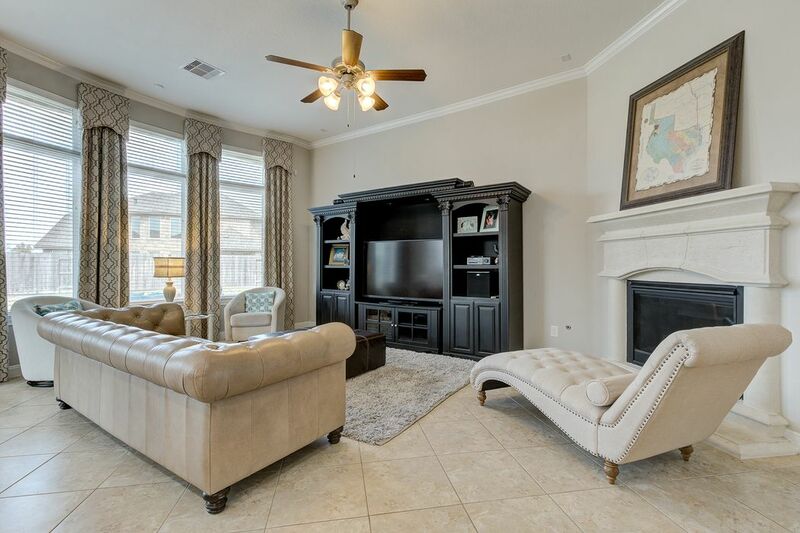 Adjoining large family room with gas fireplace and cast stone mantle. 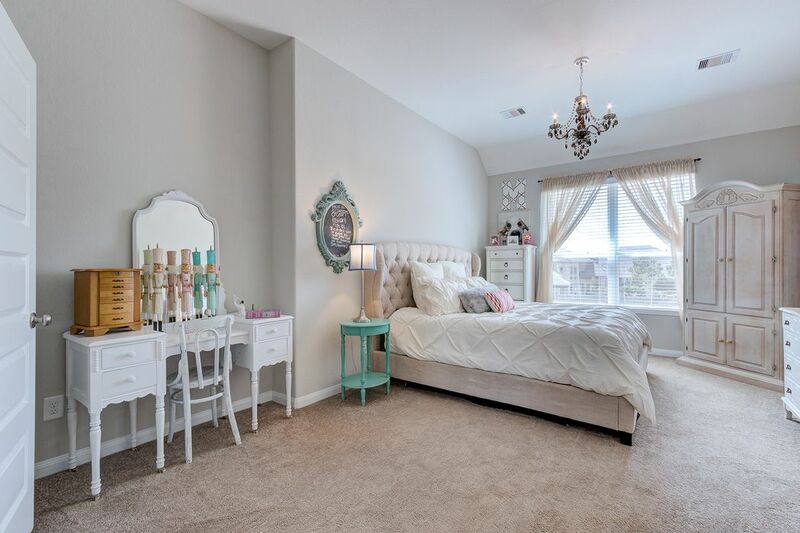 The neutral tones carry throughout. Windows flanking the breakfast area showcasing more cabinets, and custom draperies. 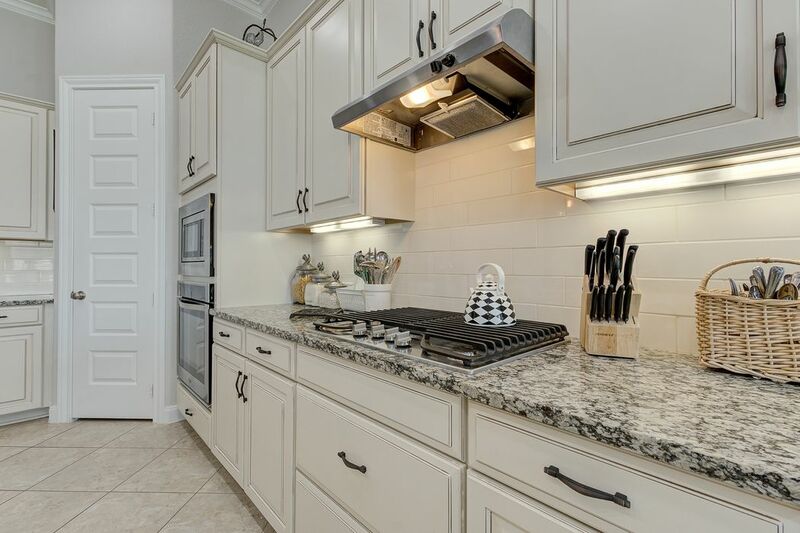 Granite counters with tones of grey and off whites, subway tile back splash, and gas cook top ideal for all chefs and entertainers. 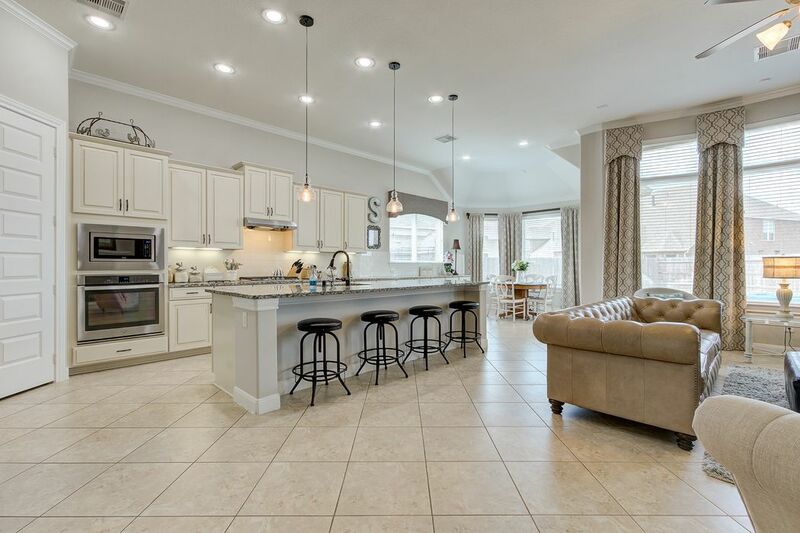 This center island is large enough to seat 5 or more making it ideal for the future gathering place of all family functions. 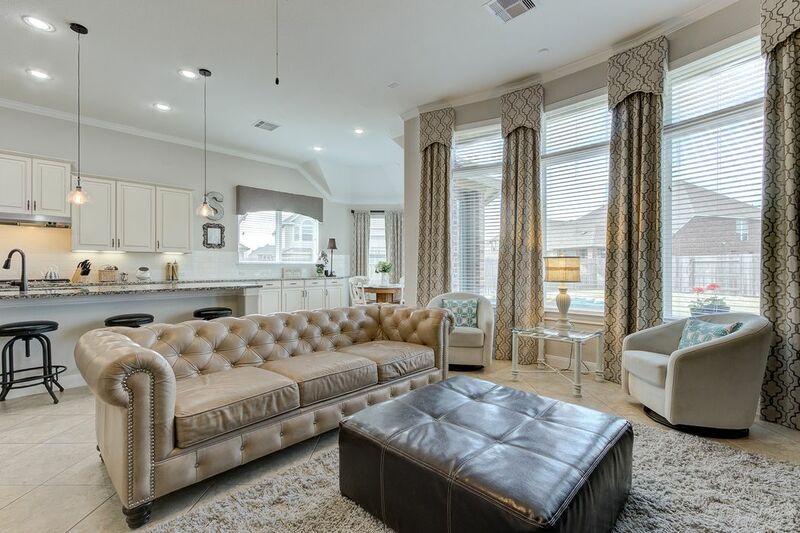 Welcome to your new master retreat with custom drapes and large windows. 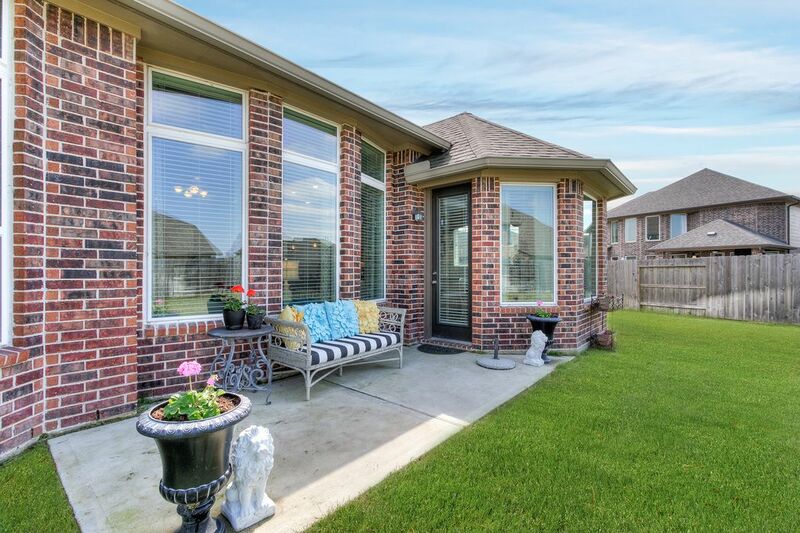 The view out of these windows leads directly to your large yard and future backyard paradise. 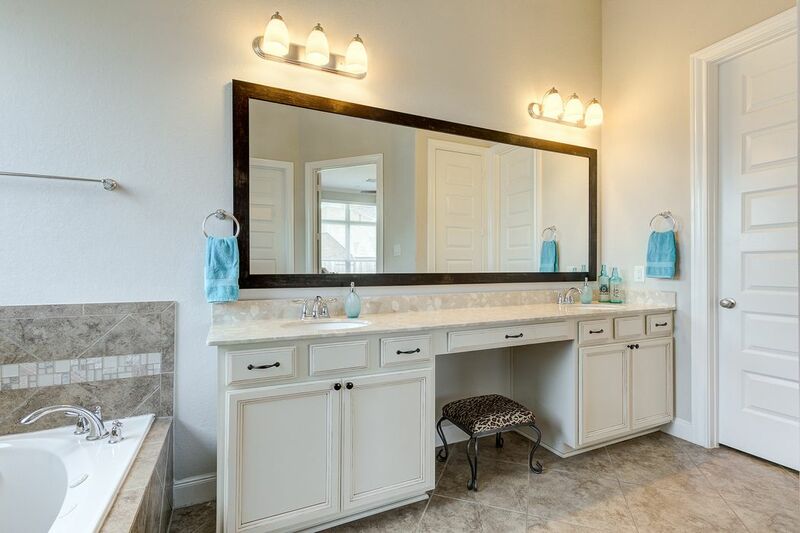 Your master bathroom has double sinks, light cabinetry, jetted spa tub, and over-sized shower. 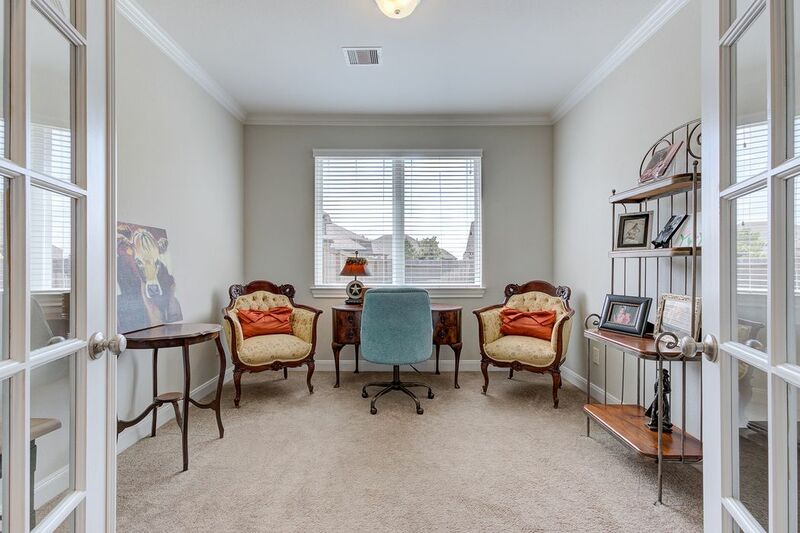 From here you have access to your large walk in closet. 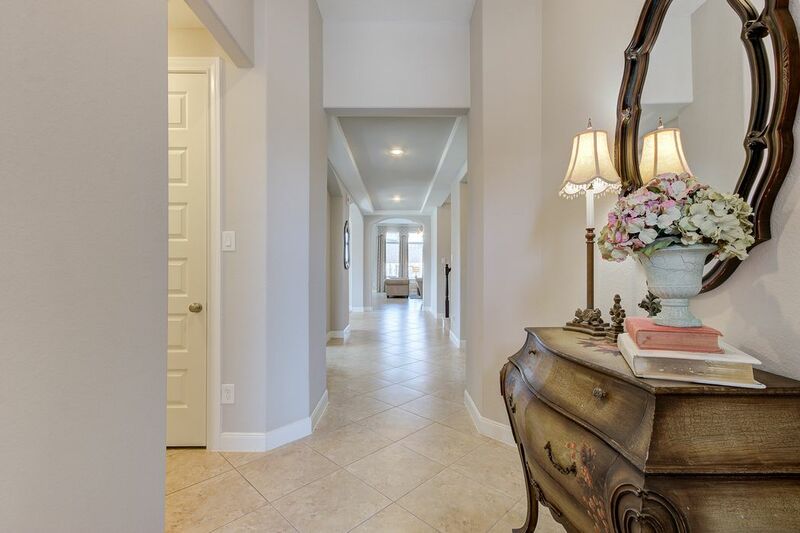 From your entry you have direct sight to the rear of the home. From here your first guest room and full bath is located. Your first guest room at the front of the home directly near the first full guest bathroom. 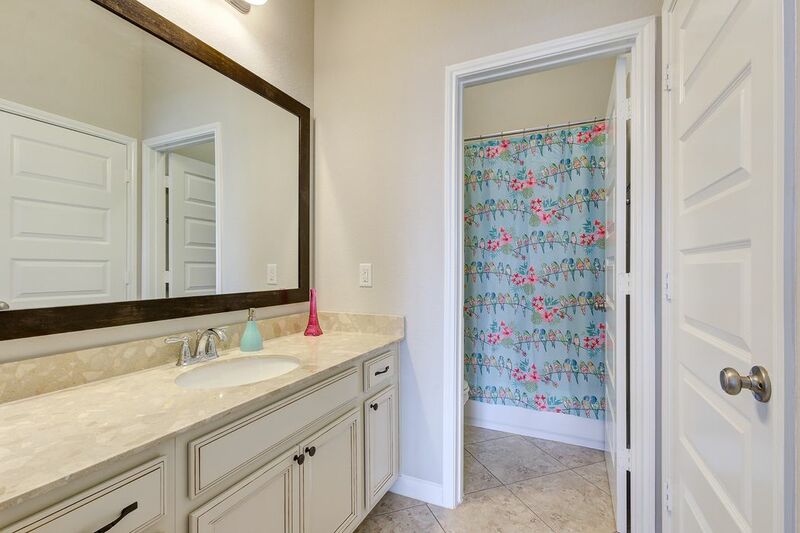 First of two full guest bathrooms on the first floor. 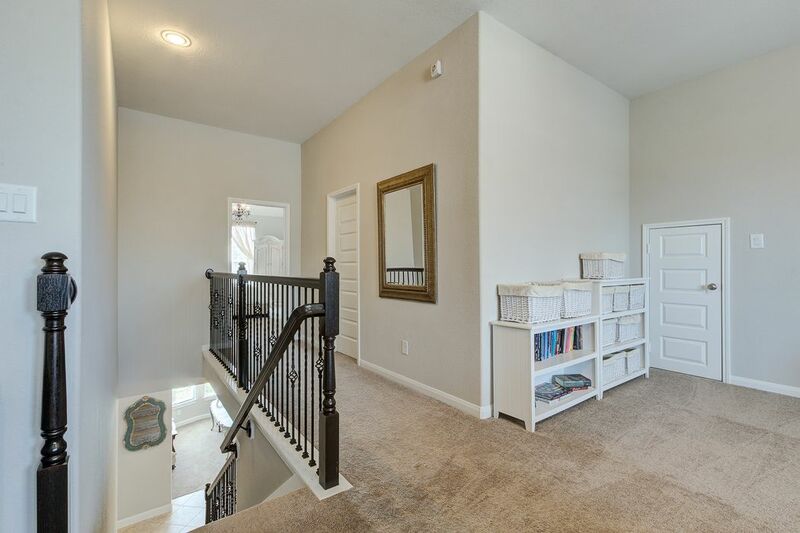 Also off of the walkway into the home you will have your private office on the first floor. The second guest room on the first floor is located discreetly behind the stairs allowing for privacy and seclusion. 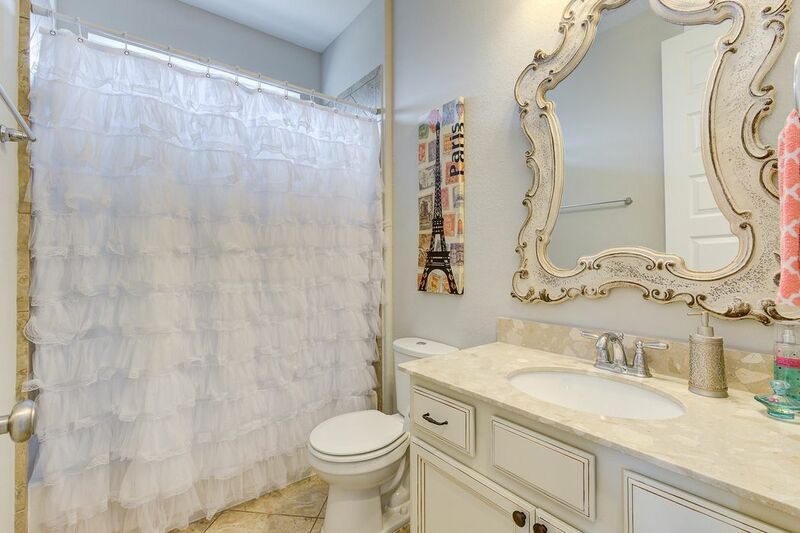 This room is also directly next to a full guest bathroom. Your second first floor guest full bath by the stairs. 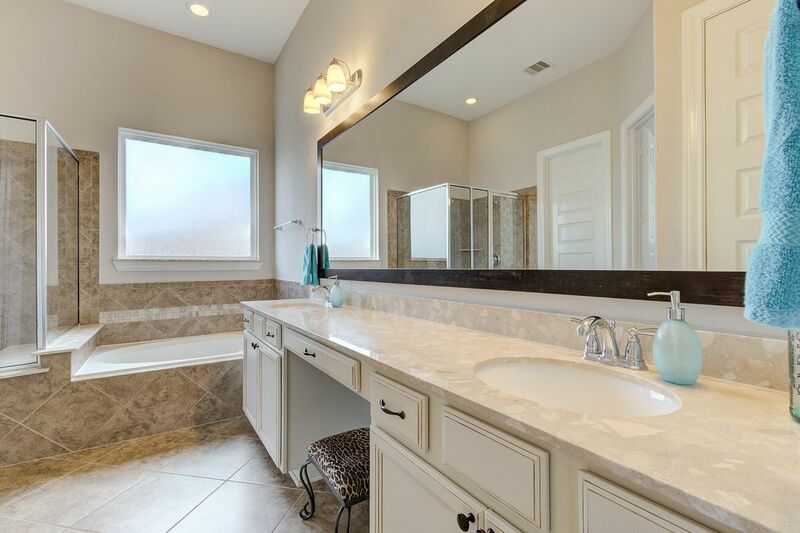 This bathroom is large with extra cabinetry and framed mirror making it truly beautiful. First floor Media Room!! Nestled quietly out of place to enjoy the late night movies. 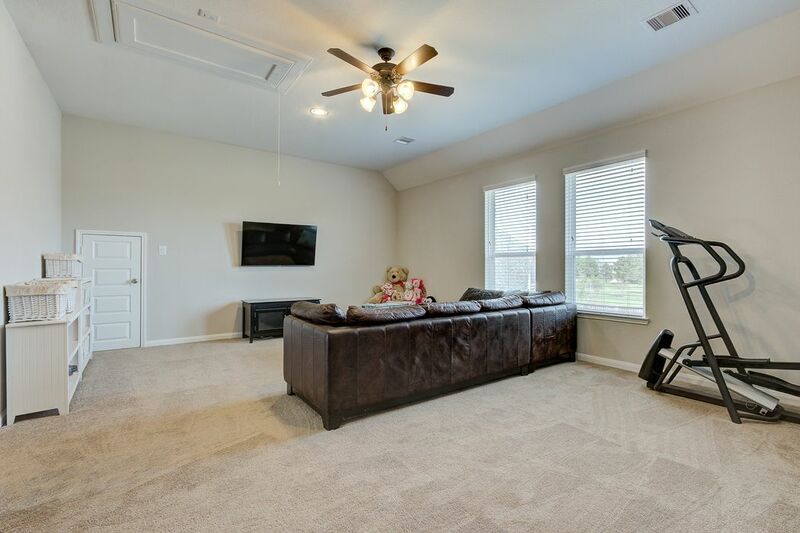 Second floor landing into a very large game room. 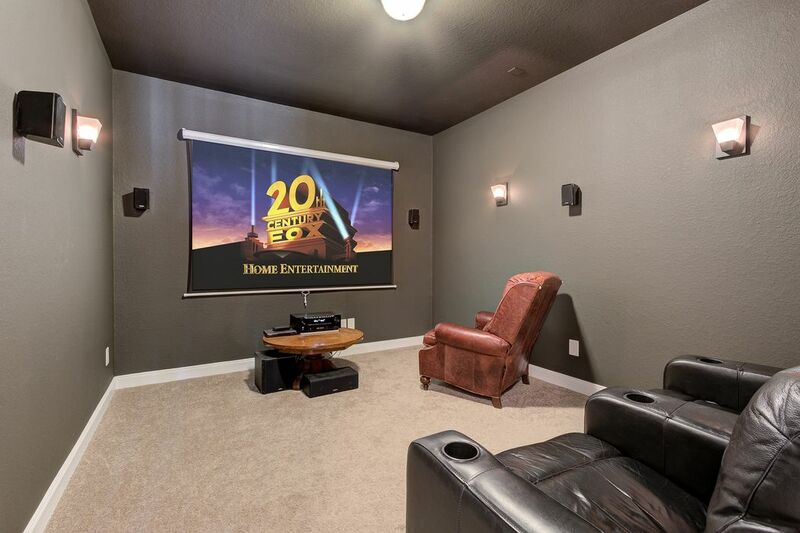 Large game room has space for multiple forms of entertainment. 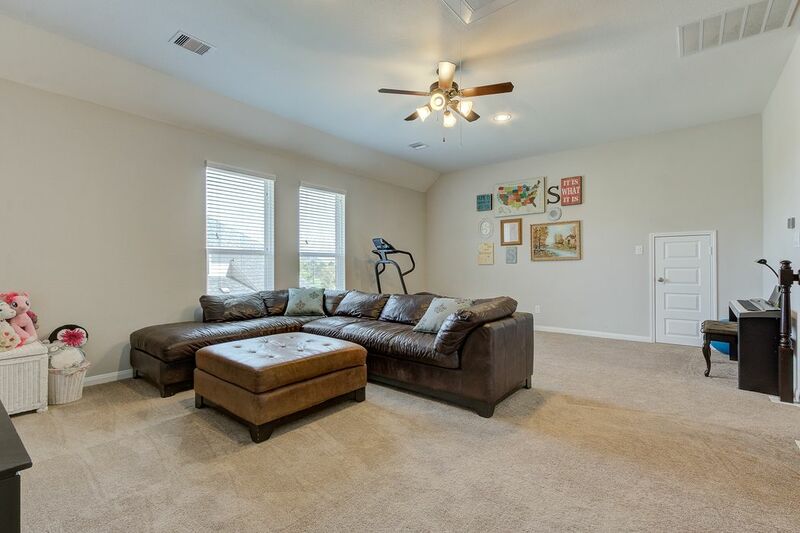 Pool table, tv space, music, and so much more. Large bedroom with en suite bathroom making this room possible secondary master bedroom. 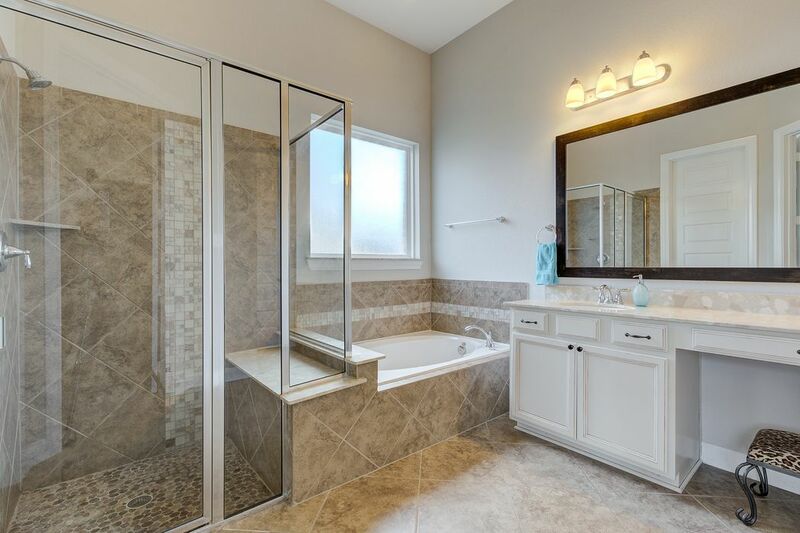 Full bathroom with separated bath and shower space. 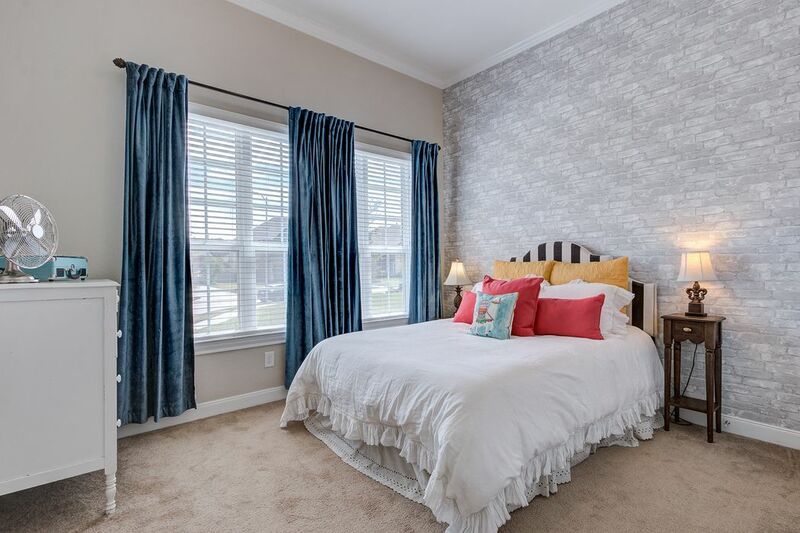 Directly connected to your secondary master bedroom on the second floor. 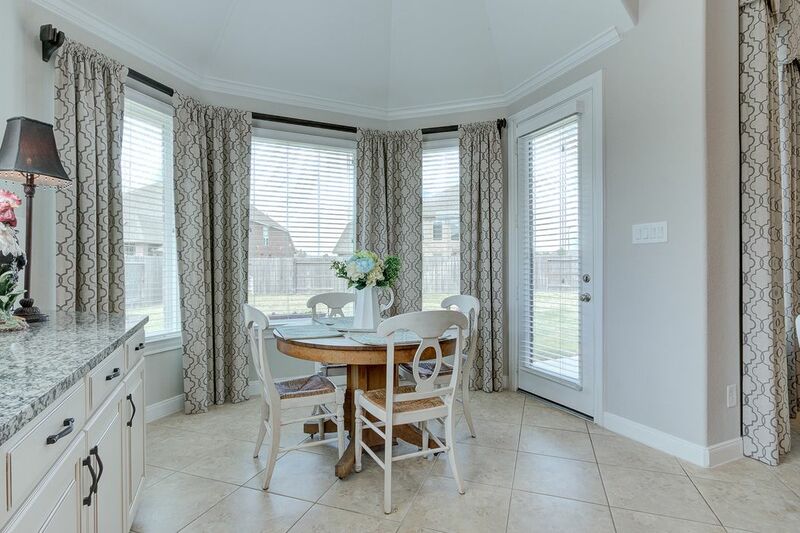 Attached patio off of your living / breakfast rooms. 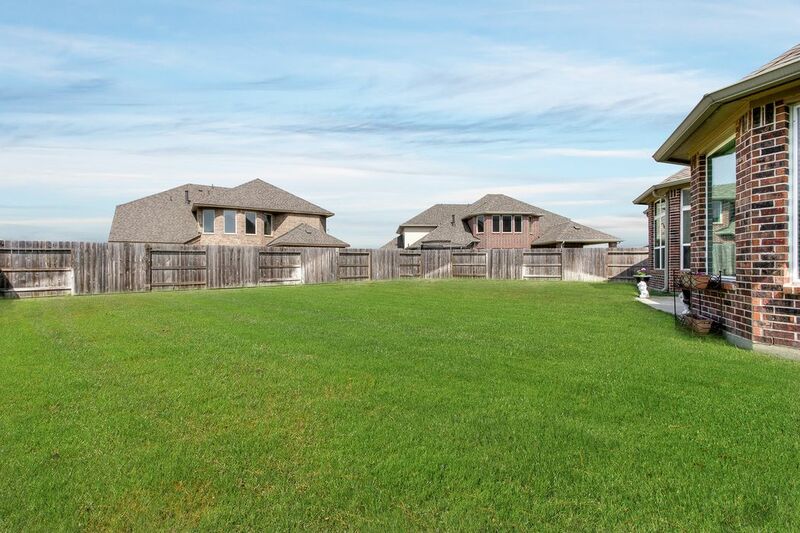 From here you have views of your expansive yard with space for everything possible. Four sided brick around the home.. a very important upgrade made at time of building. Views of your large back/side yard. 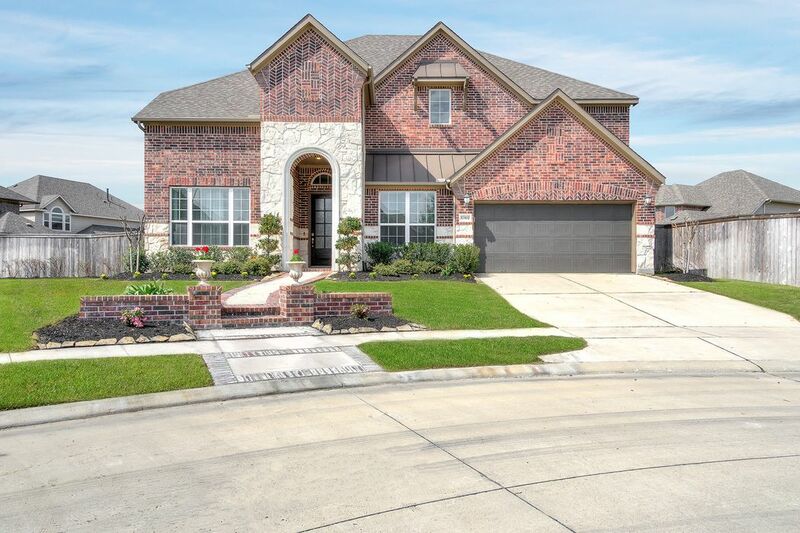 $429,900 4 Bedrooms4 Full Baths3,638 sq. ft. 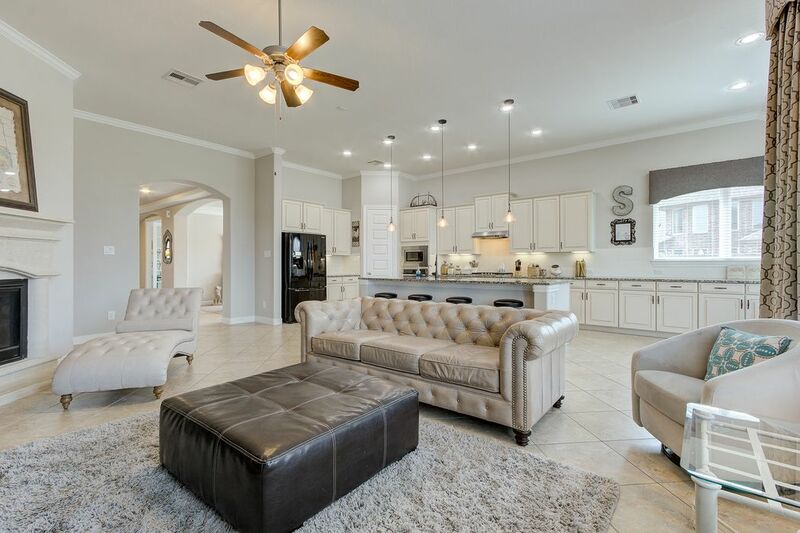 Welcome to this beautiful Meritage Waterleaf home on an expansive cul-de-sac lot in Bridgeland Hidden Creek. 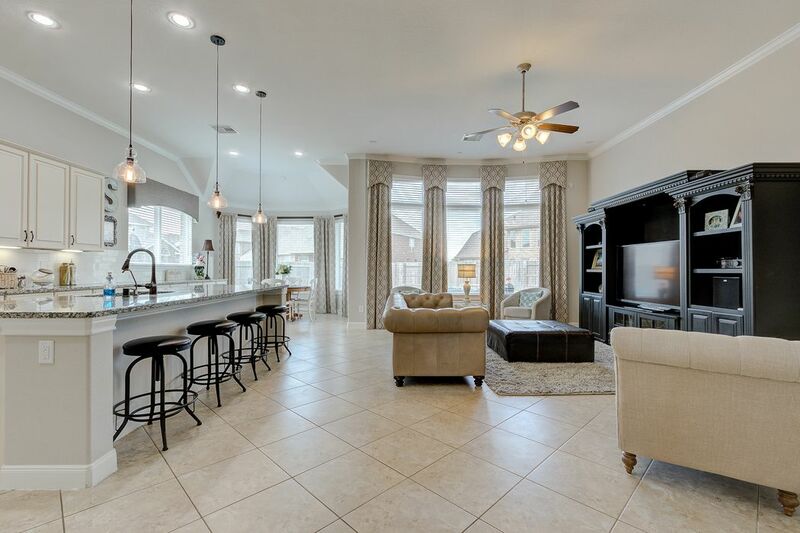 This versatile four bedroom home with three bedrooms and media room on the first floor, has a large game room and second master bedroom on the second floor. Beautiful sight lines and color palette as you enter this great home. 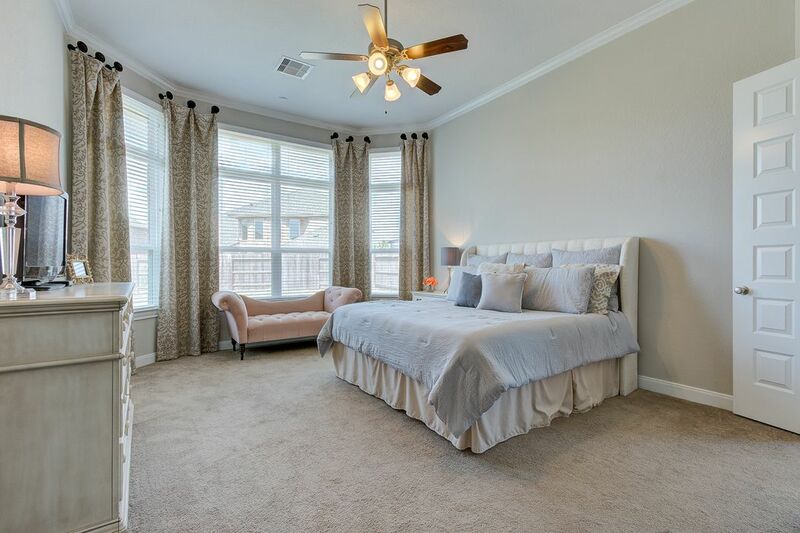 Your three first floor bedrooms are situated throughout the home to allow for maximum privacy. 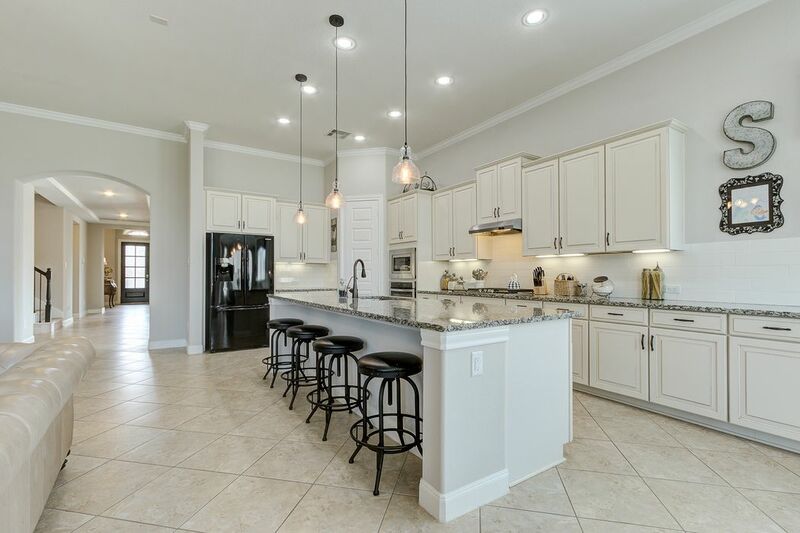 As you will see your kitchen is expansive with granite counters, numerous cabinets, and wall of windows letting all the light in. 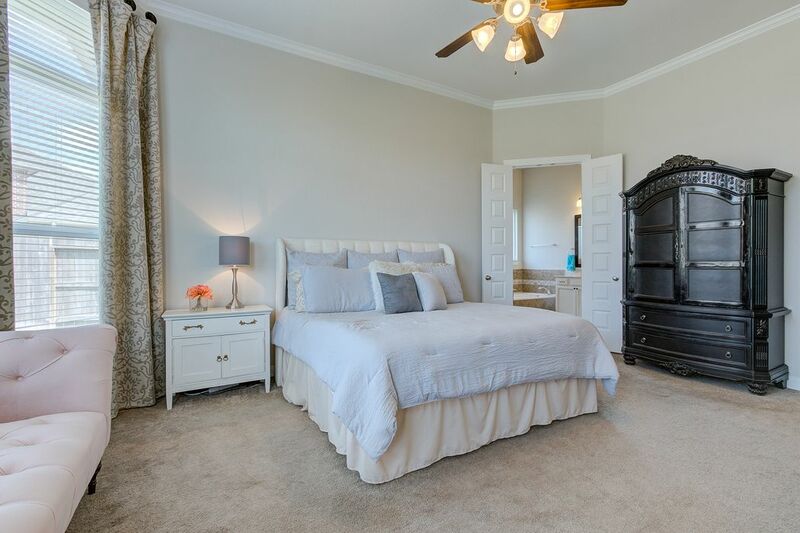 Your master suite is also large with views to the expansive back yard. 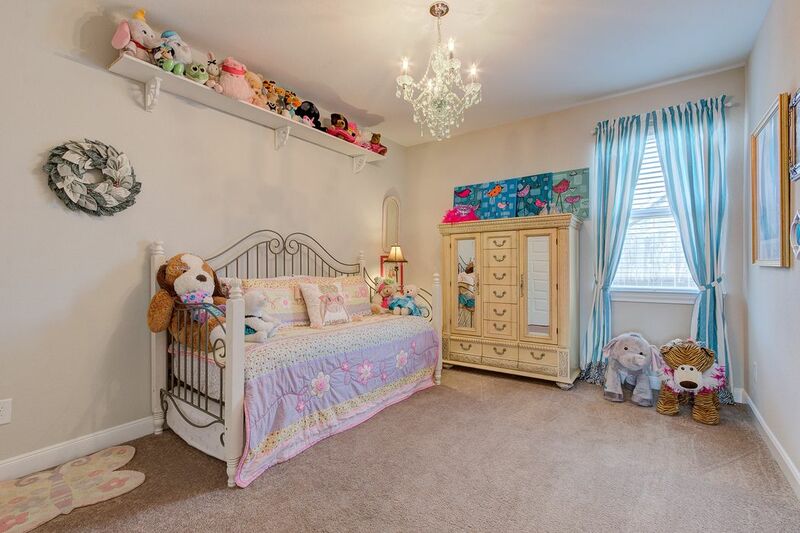 Upstairs you will see your spacious game room, secondary master bedroom, and large bathroom. 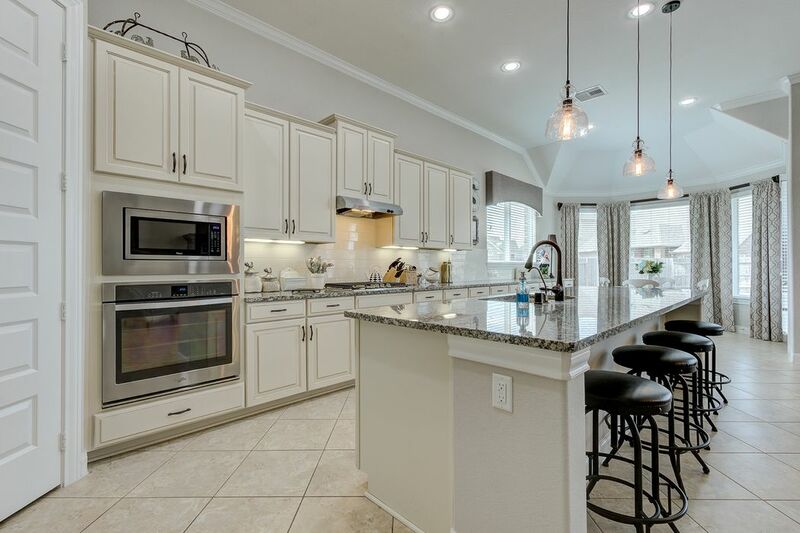 This floor plan is versatile and could meet multiple family needs. 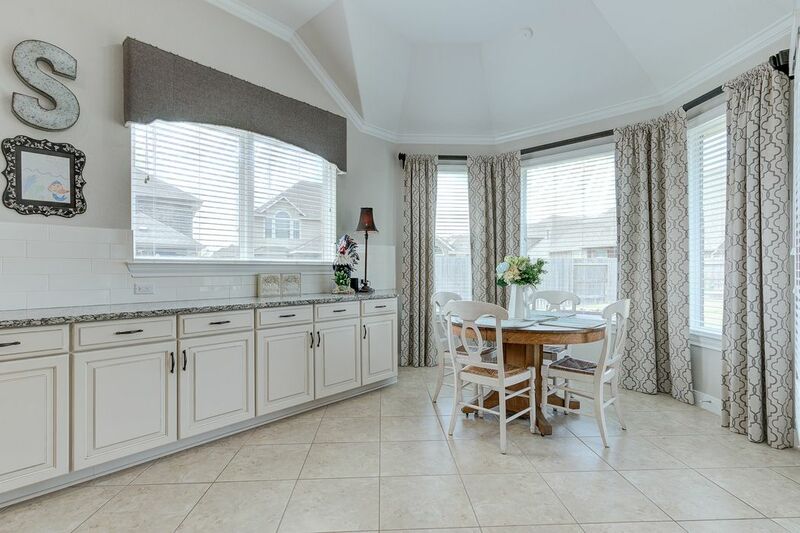 Situated on an over-size lot, with the privacy of a cul de sac street sets this gorgeous home in an ideal setting within the highly coveted Bridgeland community.